Look around you, you are bound to see several products made from wood. Yet there are still many people who question, what is joinery? Joinery is a skilled trade which involves constructing furniture, houses, ships, offices, shops. This usually involves materials such as wood and timber but can often incorporate other materials such as plastics and cement boards. Joinery can either be simple or complicated, it can either involve two pieces of wood being nailed or glued together or it can involve intricate joining of two pieces of wood. Although the primary purpose of joinery is to hold wood together strongly and securely, yet it can also be used in a decorative manner too. Joinery is an important part of woodworking and is found almost everywhere you look in furniture, windows, doors and flooring. It is a specialist area of carpentry where you would get a specialist joiner or cabinetmaker to do the work, rather than a general carpenter. Many people are unsure what the difference is between a joiner and a carpenter. If you need something fixing that involves wood, who do you contact? 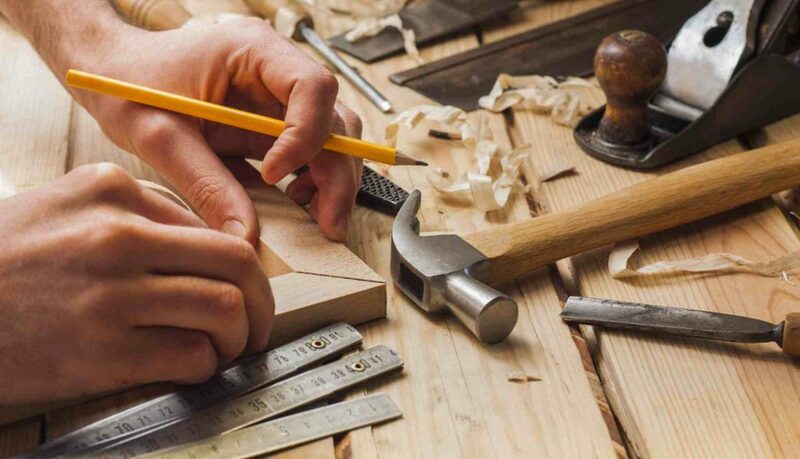 Both carpenters and joiners share many traits however they are referred to differently depending on your UK location – the south of England tend to use the term carpenter whereas the north of England tend to use the word joiner. Both a carpenter and a joiner are tradesmen within the construction industry and largely involve working with wood. Joiners are trained craftsman who makes or joins the wood, usually in a workshop, whereas a carpenter constructs the timber on site. In simple terms a joiner makes the wood that a carpenter then fixes on site. A joiner therefore is usually associated with making doors, windows, staircases and fitted furniture that are normally made in a workshop off site, due to the heavy machinery involved. A carpenter however tends to specialise in larger elements such as constructing and fitting roof trusses, stud work and floors on site, by cutting and fitting them together, using a range of materials and tools. Carpenters however are responsible for the assembly and framework of a structure. Because of the small, light tools that they use, it means they are much more flexible and are able to work almost anywhere. Bespoke is a word associated with an item made to a buyer’s specification. Custom designed and fit joinery allows us to make the most of every space and to maximise storage in the neatest and most visually appealing way. Store bought furniture such as wardrobes, shelving units, TV units and cabinets cannot be customised and are usually not fit to the specific space you have. Well designed joinery not only fits your space perfectly it allows for an inconspicuous way to hide away your clutter. Custom joinery also adds value to your home in terms of usable living space. Well-made custom joinery will exceedingly outlive a generic store bought piece and it’s something that stays with your home as long as you own it. Custom joinery eliminates the need for the odd little storage cabinet or shelf here and there allowing you to best use the space available. When a joiner designs custom joinery, they take into account the space the piece is being used in from the very start of the project. Therefore, rooms and the joinery are designed keeping in mind the amount of space available and what functions the custom joinery needs to perform. Did you know that wood is one of the most abundant, renewable and sustainable materials available? With a natural beauty you won’t find in any man-made material. Did you know along with all of this, that wood is a fantastic insulator too? Wood has great thermal and sound insulation qualities. Add Value – Incorporating beautiful storage solutions and stunning staircases will add a wow factor to your home which also enhances your living space. Create Light – Joiners can help create the best solutions to your home. They can help create more light in dark spaces and wooden doors can help significantly reduce your energy bills. Express Creativity – One of the biggest benefits a joiner can offer is bringing your ideas to life and help you to express your own creative style. Bespoke Pieces – If you are looking to make the most of your space, then hiring a joiner can have many benefits. If your home has awkward spacing a joiner can craft bespoke pieces to perfectly fit and compliment your home.